You may spend 3630 hours (or 453 working days) continuously entertaining your child to encourage them whilst they do their physiotherapy treatment. Is this reasonable? We’re super excited to reveal the news that Playphysio was featured on this evenings episode of The One Show on the BBC! 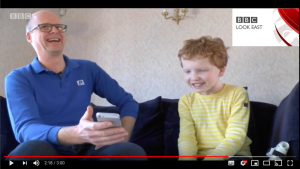 Roving reporter Anita Rani explains how projects funded by Comic Relief grants are changing the lives of chronically sick children as part of this years build up to Red Nose Day 2019! Comic Relief reached out to Playphysio to help raise awareness of Red Nose Day on Friday March 15th this year. We were very pleased to be able to help explain how one Comic Relief grant is changing the lives of children around Cambridge. In December 2017 Will Jackson of Playphysio was nominated to apply for a fellowship from a brand new, two year programme – A Million Realities. We are very excited to announce that Addenbrookes Respiratory Department in Cambridge UK are calling for volunteers to take part in a trial of Playphysio® mobile games and our myPhysioPal™ monitor. Are you interested in taking part? Playphysio is a member of the ‘Serious Impact’ incubator run by Allia in Cambridge. Allia invited me to take part in VentureFest East 2017 at Newmarket Racecourse Cambridgeshire, in the ‘Meet the Future’ session. Representing Playphysio I pitched to VentureFest East attendees for the award ‘Impact Entrepreneur 2017’. Playphysio has won a High Commendation award in Medtech Startup category for our gamification of respiratory physiotherapy from the Cambridge Independent Science and Technology Awards. On 27th June 2017 we set up our demos and presentation at Bates Wells Braithwate LLP at their London office ready for the Stephen Lloyd Awards finale event.